I am a bit puzzled about TV tuner cards. They capture in MPEG 1 and/or 2, but do any of them capture in AVI? I do realise the AVI files would be huge. I am toying with the idea of buying a Leadtek capture card simply to record kids shows (usually 30 minutes at a time, which I will then burn to VCD) and wonder if direct-to-MPEG capture really cuts the mustard as far as quality goes. Would it make any difference capturing in AVI then converting to MPEG as opposed to direct-to-MPEG? Some cheap capture cards (as opposed to the more expensive proper-videographer options) have software that lets you capture to AVI, but it's important to note that "AVI" is not one monolithic format; it's Microsoft's wrapper for video (and optional audio) that can be compressed in many, many different ways. The AVIs made by low-cost capture cards are likely to be, as you say, gigantic, but software that allows you to create AVIs using arbitrary codecs (see here for info on various codecs) will let you do a lot better. If you use some other codec, though, you're going to be using your PC CPU to do the compression (actually, you'll probably be using it anyway, with cheapo capture cards; they've often got little to no onboard compression power), which means that even if you've got a fire-breathing machine, you're going to be restricted to the lighter-weight codecs. Those codecs produce either great big files, or lousy looking video, or both. If you've got the disk space for it, you can capture in whatever minimally-compressed vast-files format the card and its software likes best, and then recompress the video using, say, DivX, to get a much smaller result that looks almost as good (but which isn't in the right format to burn to a video CD). DivX recompression will take a lot longer than the video took to capture, though. I was wondering how great the difference in efficiency would be between wire wound transformers and their switchmode cousins? I was considering the 10 odd transformers I have below my PC equipment, and if I would be better served (and tidier) if I replaced most of the 12V ones with one big switchmode transformer. Some of the transformers get rather hot even when idle. Also, would a wire wound transformer still be consuming much power when it is not under any load (i.e. turned on but not plugged into anything)? I am considering all this for the purpose of backup via a UPS (and related battery time), rather than trying to save 50c on the power bill. Switchmode supplies generally have efficiency above 85%; linear supplies (the old-fashioned kind, with a big heavy iron-core transformer inside) are generally down in the 40 to 60% range. Or 0%, when the device they're plugged into isn't turned on; linear supplies keep themselves warm when idle, as you've noticed. You could, indeed, replace a bunch of DC plugpacks with one big multi-output power supply (note that if you've got devices that expect an AC plugpack, feeding them DC may be a very bad idea). A computer power supply with only its 12V line loaded may do wiggy stuff (computer PSUs expect some load on the 5V rail; old ones wouldn't turn on without it), but a dedicated 12V switchmode box would do. Or, more simply, you could just get a bunch of switchmode plugpacks; they're off-the-shelf items these days. Here in Australia, Jaycar has a decent range of them. Idle linear PSUs draw something like three to seven watts, depending on the size of the plugpack. Switchmode plugpacks should all draw less than a watt when idle. Today, I bought a new keyboard. A cheapie Chinese model, but it has the Insert, Delete, Home and End keys just where I like them. All would be well - except that just where the Insert key was on my old Microsoft keyboard, there is now a key with "POWER" written on the keytop. Annoyingly, it also works as advertised. I'm mostly happy with the new board apart for this button. The IntelliType software that came with the (now dead) Microsoft board allowed me to turn certain keys off. Particularly Caps Lock, which I hate with a passion. I've trawled the Net, but can find nothing that might suggest how I might disable the new keyboard's POWER key. I never want to use it. Apparently, this is some ACPI business, and you can change what it does using Windows Control Panel. In Control Panel, I can change what happens when I press the POWER button on the front of my computer (I've set it to "hibernate"), but nothing about what happens when I press the POWER key on my keyboard (now it also does a hibernate). Some motherboards have a BIOS option or jumper that lets you disable such a key. Many don't. 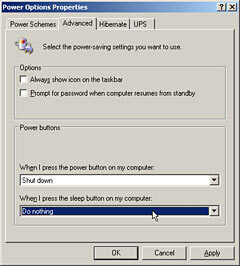 You can disable a "sleep" key in WinXP, by using the Power Options Properties; some keyboards have a "sleep" key that's just labelled "power". Failing that, you can always try glue. Seriously - it's not as if any sensible person is ever going to want to use that darn key, so just pop the bugger off and disable its switch. Tape over the contact pads will do it, if it's the usual kind of rubber dome keyswitch (you'll probably have to dismantle the keyboard to get at the contact sheet, though...), or you could just fill the keycap with epoxy and settle it back into place, if that looks like working with the particular keyswitch design you see. If the switch is sufficiently recessed then just popping off the keycap will probably be an adequate solution by itself, but it's not pretty, and you could still drop a pencil in there or something and hibernate the PC. If there's a plain old software solution to this problem, you may have guessed that I don't know what it is. I have an old P-III 433 that has an AOpen MX3WPRO-V motherboard (well, that's what it says it is on the driver CD). What kind of an upgrade can I do? Is it possible to install a Pentium 4 chip on this motherboard? Will I have to buy a new mother board to run the latest games and apps? AOpen's page for this board is here. It's a 100MHz-FSB-only board, and the fastest CPU the manual says it supports is a 700MHz P-III. It's possible that you'd be able to run any 100MHz-FSB Celeron on that board, so you could probably drop any 18 micron Celeron onto it (the fastest of which is the 1.1GHz; the 1.1A is a 13 micron part that's unlikely to work). That's assuming you can find someone selling those older Celerons for reasonable prices, of course, but if you can then it'd be a worthwhile speed increase. Apart from that, the best you're going to be able to do is buy a third-party adapter that'll let you use a newer processor, like this one. This really isn't worth the trouble unless you have an incredibly strong desire not to get a new motherboard. Any microATX board should work fine in your case, and getting one will let you run whatever Socket A or Socket 478 CPU you like. Businesses that really do hate the idea of swapping in new motherboards - and reinstalling Windows as a result - like processor upgrade gadgets like the Evergreen one I link to above. Upgrading that way does not, however, give you the full performance of a new PC with the same CPU; it just perches that CPU on top of the slow-ish CPU and memory buses of your old motherboard. I own a Packard Bell PC (I hate it! ), with an 800MHz Duron CPU and 256Mb SDRAM. It also has an ATI Radeon 32MB SDRAM chip inside it. I play games a lot, and I wanted to upgrade my PC so that the games run smoother. I saw a new Radeon 9000 64MB on sale for $AU135. Would this be worthwhile in terms of enhanced performance? Sorry, but I don't know whether your PC's upgradable or not. I'm pretty much certain that you've got a Radeon VE, and if it's in an ordinary AGP slot then you ought to be able to yank it out and replace it with a better board, which would indeed give you a decent improvement. If your motherboard has the Radeon built in, and also has a real AGP slot, then you should also be able to upgrade. But you've got a brand name machine, and I'm making no bets whatsoever about what you can and can't do with it unless I can at least see a manual for it. Needless to say, Packard Bell's Australian site is no use whatsoever in this area, although it did make my day slightly more surreal by showing me, wait for it, this. The Packard Bell UK site might have some worthwhile info, but I don't know which of those downloadable documents, if any, are relevant to you. might put you on the right track. Some Web sites say that magnetic strength obeys the inverse SQUARE law and others the inverse CUBE law. Which is right? (When I get some rare earth magnets I'll try an empirical test, but until then, I would appreciate your opinion). It's the inverse cube law, more or less. Generally speaking, getting twice as far away from a magnet leaves you with 1/8th of the magnetic flux. Where the "middle" of the field is, though, and how it's distributed, depends on the shape of the magnet and in what direction it's magnetised; magnetic fields are not spherical. All things being equal, larger magnets have a gentler field strength drop-off per unit distance than smaller ones. This difference can be enough to make up for a very large difference in maximum field strength. For instance, the field strength on the surface of a big ferrite speaker magnet is likely to be less than a tenth of the field strength on the surface of a shirt-button-sized rare earth magnet, but the field strength a foot away from the speaker magnet will be much higher, because the surface of the ferrite is already a few inches away from the middle of its field pattern, while the surface of the little rare earth magnet is only a couple of millimetres from field centre. Measure 2mm further away from that rare earth magnet and you've got 1/8th field power already; measure 2mm from the surface of your giant two kilogram speaker magnet and the field strength will hardly have dropped at all. Put six inch wide speaker magnets on either side of your head, arranged to attract each other, and they'd probably sit there (rather uncomfortably) without any strapping to hold them in place. They'd manage a field of at least a few hundred Gauss in the middle of your brain. Read with interest your review of the new Logitech mouse devices, in particular your observation of the importance of the little rubber/soft plastic wear pads in each corner of the base of the mouse. I have been using a Logitech optical wheel mouse for about nine months now and noticed that these little pads are indeed wearing out, and will soon need replacing. I've tried to elicit a response via the Logitech website but they either don't understand what I'm referring to or consider my request for assistance to be too insignificant for them to expend the effort. Have you, in your travels, located a source from whom replacement pads can be purchased? I expect that I might have about another month or so of life left in the originals and really require some assistance in locating some suitable replacements. It's apparently possible to get free replacement pads out of Logitech, if you live in the right country. A reader from Germany tells me that when he filled out the appropriate feedback form, new pads were in his mailbox a week later. Logitech Australia don't seem to be that generous, though. Failing that, Mouse Skatez will do the trick. Why would I buy a Canon Digital IXUS V2 camera from Ted's Camera for $AU750, when I could buy a PowerShot S200, the exact same camera, from Adorama for US$260 ($AU445)? It costs $AU557 including air mail shipping. I should mention that like most Australian geeks, I have a NTSC capable TV, so the difference is zero, except that Adorama will throw in a 64Mb memory card. After the introduction of the GST, I thought luxury items like cameras were supposed to get much cheaper. Right? It makes no sense to me that identical cameras should be cost $200 more here. Bear in mind that your $AU445 will probably have another $44.50 GST tacked on at Customs, though you might sneak through. So that's a bit more than $AU600 all told, versus $AU695 plus local shipping, which is which is what Dirt Cheap Cameras charge for that camera. You save a hundred Australian bucks by buying from the States, but you get functionally no warranty support - well, unless you want to pay to ship the camera to and from the USA for repairs. A 64Mb CompactFlash card's about a $AU50 item these days, so there's that, but you're still paying about eight-tenths of what the same setup would cost you locally. After the GST replaced a chunk of Australia's entertainingly complex tax system, things like cameras did get cheaper. But we're still living in a country that's getting on for the size of the continental USA, but has the population of New York State. That pretty much explains it, right there.